Colbert, my male cat, is from the French side of our island (St. Martin). He is the essence of laid-back cat, which fits his Caribbean home perfectly. French and Caribbean, the epitome of romantic, affectionate, and the greatest lizard hunter of all time. Only on rare occasions does he fail to bring home a large live island lizard to slay for the two of us on the staircase inside our home. What a provider! If only he would keep the blasted lizards outside so there would be no reptile guts to clean up after. Yeah. Sometimes the lizards are so big that even the female gets a good portion before leaving me leftovers. The little female, which I haven’t been able to draw yet, is a cute little thing. (We adopted her from the veterinary clinic when my beloved Shadow died of pancreatic failure. Mistress Weatherwax was about to lose her little six-week life. We couldn’t allow such a sweet kitten to die on the same day I lost my best friend.) She’s a few months older than Colbert who joined our household two months after her, but she looks younger, delicate, and somewhat petite. She’s a bit rounded, but light as a feather. Colbert is sleek and long, solid muscle, and surprisingly heavy for his size. Looks can be deceiving. Colbert may be the Big Game hunter, but his little lady prefers the smaller, far quicker prey. She may single-handedly be keeping the varmint population in our community in check. She’s also not intimidated by the older, more established cats in the community, even when they are twice her size. Colbert has no problem with these other cats, either, but he seems to take the attitude that no fight is better than any fight. She, on the other hand, chases those other cats to the surrounding community wall or into the lagoon, depending on their choice of direction. Together, my two cats make a pretty dynamic duo. One day, I hope to be able to capture Mistress Weatherwax in a drawing, too. But it will be a while. Her schedule is very full. 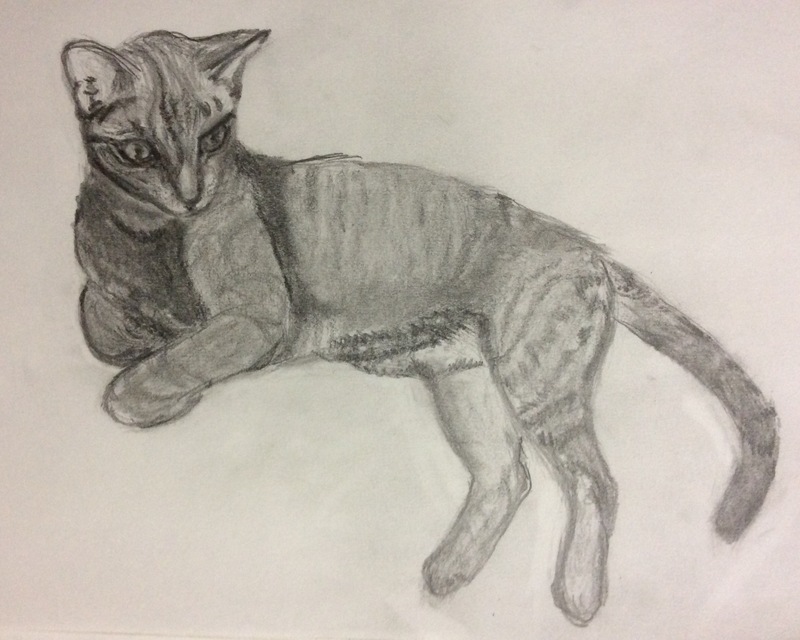 This entry was posted in Art, Writing process and tagged cats, drawing. Bookmark the permalink. I love your drawing and your wonderful story!! I have 50 cats in my care, at current. A portion of them were once feral but they have been in my care for many years and they are tame, where I am concerned. I also have many of the feral kitty’s kittens, that were born in process of trying to trap/spay-neuter, so they have been with me since a very young age. I love to hear stories about other’s kitties. Wow! 50! I hope you have enough room for yourself! Bless you for being a fiend to cats. Except for Bear who simply needed a home, all our cats and dogs have come from shelters or rescue groups. All are or have been sterilized so they bring no more into the world, even if their kittens would have been precious . We donate when we can to keep catch-neuter-release programs viable. Far too many unwanted, abandoned, and feral cats and dogs running wild, getting so cold, and dying unloved. Thanks so much for commenting! Good luck with your furry family! I found two cat colonies in 2004. The cat rescues would not help with anything for them. It took me some years but I trapped them and got them spayed and neutered, but by the time I was able to get them all done, due to money, it turned out to go from 50 colony cats, plus all of the kittens born, during the time I was trapping them, to equal 80 cats that I spayed and neutered. Now, this many years later, I have some of the original colony cats and their children. Four are my personal kitties, thirty three are of the colony cats and their children and thirteen, I rescued and had spayed and neutered, from a new area, so has me with 50 to care for until they die. It upsets me to see people do not spay and neuter their pets. There is a good reason for doing so!!!! Bless you for all you do for the cats! I agree about spaying/neutering. There are so many no- or low-cost options for doing so. Unless breeding for show, there is no reason to allow pets to breed. All our pets have come from shelters, and we have always spayed or neutered. There are too many unwanted cats and dogs without homes or care. It is irresponsible to allow pets to breed randomly. Thank you for your comment. I wish you luck with your colonies and personal pets. All the veterinarians here on the island–French and Dutch–offer free medical care and spay/neuter services to cats and dogs captured by the several catch and release programs. Rescue groups feed and clean up after “their” ferals on a regular basis. Most feral here are either friendly or not so wary of humans that they would starve, thankfully. Everyone I know feeds ferals and contacts the programs if a new kit or pup shows up for dinner. Most of them look like family pets out on a lark. It is rare to see an ill cat or dog here, unless they have cruel owners–but those usually get reported. I wish people everywhere were as good to feral cats and dogs as the island residents are. Keep up your good works! You are clearly a very caring person. Your drawing drew me in and reminded me of the feral cats that we enjoyed interacting with in Mexico (near Tulum). I enjoyed reading about both your cats and the day to day of living in the Caribbean. Thanks for commenting! We also have many feral cats here. Interestingly, many are very friendly with both pet cats and humans. You are very welcome, I enjoyed reading your post! Reblogged this on Roberta Pimentel. great drawing. well done. and interesting to read about your cats in the Caribbean. such a different life to us in the city. so much we take for granted – like regular electricity. the cats i know in Australia are all very keen lizard hunters. have you posted about other aspects of your life in the Caribbean? i’d be interested to read more. by the way, do you ever holiday on the Cote d’Azur? i rent a little apartment (24 square metres) in a small fishing village on the Mediterranean for a month each year. Libby, if we ever went anywhere, I would jump at the chance to rent a place on the Mediterranean. About writing on Caribbean life, I sneak in references, but this cat blog is probably the first in which I’ve gone into any “detail,” if you can call it that. Maybe I’d be happier here if I did blog about its many wonders and “wonders.” Thanks for the wonderful suggestion! where did you grow up? if not the Caribbean, what took you there? what stops you from leaving for a holiday? tell me it’s none of my business if you like, but i’m interested to know more. posts about life in the Caribbean, illustrated with photos, would be great. Thanks! Both our power and our internet connections have been very iffy lately. I am certain I am responding late! I just love cats.Still recovering the loss of my pet.A Persian. Yes, I remember. Colbert is a plain old Tabby, aged 1-1/2 years; Mistress Weatherwax is two months older. Both came to us because we lost two young (5-year-old cats) in a short time period. I continue to mourn Shadow, who, in a way, saved Mistress Weatherwax from the death injection. All pets are precious, and I have to believe there is a reserved sanctuary for them in the heavens. Thank you for sharing your loss. I send you my condolences.